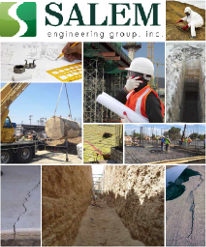 Construction Inspection & Material Testing – Salem Engineering Group Inc.
SALEM Engineering Group, Inc. offers an extensive array of construction inspection and material testing services that allows us to provide timely, professional, and thorough construction services for your project. We work with developers, architects, engineers, government agencies, utilities companies, municipalities, insurance companies, attorneys and private owners to provide comprehensive construction inspection and material testing services. With local knowledge and available resources in mind, our construction inspection and material testing engineers and field inspectors work directly with clients, developers and general contractors during the construction phase of the project, and respond quickly to ever-changing construction needs and schedules. Our laboratories are managed under the direct supervision of a State Registered Civil Engineer. SALEM Engineering Group, Inc. administers an internal Quality Assurance Program, which outlines the required Quality Control and Quality Assurance practices for our firm. Our manual is regularly updated to ensure up-to-date compliance with national agencies in which we have membership. In addition, most of our laboratories is inspected and maintains one or more of the following certifications: CALTRANS, AMRL, CCRL, Division of the State Architect, Laboratory Evaluation and Acceptance Program (DSA-LEA), and American Association of State Highway and Transportation Officials (AASHTO) Accreditation Program, which is completed on a bi-annual basis. Each of our laboratories are equipped with full scale laboratory testing equipment and properly trained staff.